AICAR uses metabolic pathways to block certain enzymes, which allows for AMP-activated protein kinase. This can be explained to the layperson like this: once you take a substantial amount of AICAR, it tricks your body at a cellular level in to thinking that exercise has just been performed. Since the body thinks it has just done a considerable amount of exercise, the energy cycle at the cellular level starts converting fuel sources, like fatty acids, to output the energy that was thought to have been spent during exercise. This can have a direct effect on the level of endurance activity and the sustainability of that activity. Insulin sensitivity is also noted to be one action that AICAR produces, as the body will think it just went through a series of exercises. Interestingly, in animal studies with obese mice, AICAR showed all of the peptides benefits for obese diet induced mice, yet the healthy lean mice did not reap any of the benefits of insulin sensitivity or increase in glucose uptake. That being said, the application in bodybuilding does not seem very suitable, as these mechanisms are targeted for the out-of-shape and overweight, so if you are not a top level endurance athlete I just do not see the reason for using AICAR. A much better option would be Cardarine (GW-50156), as this compound is readily activated by exercise, so the need to work out or cardio would be an incentive. 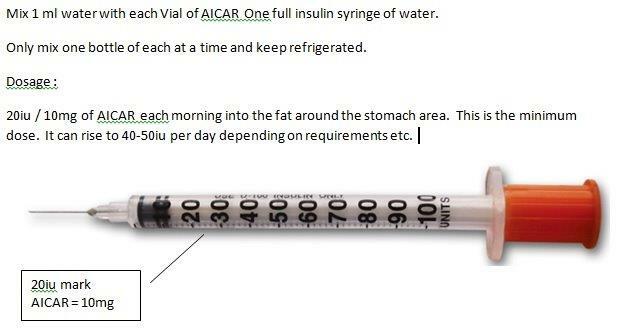 Mix 1 ml water with each Vial of AICAR One full insulin syringe of water. Dosage :20iu / 10mg of AICAR each morning into the fat around the stomach area. This is the minimum dose. It can rise to 40-50iu per day depending on requirements etc.